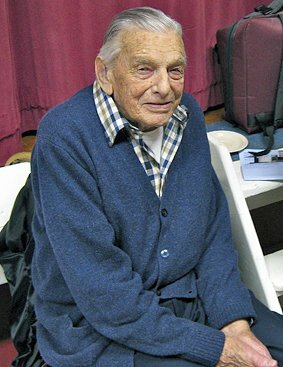 Stan Seaman, traditional melodeon player and skilled rope-worker, died on 9th June at the age of 93 in Southampton hospital after a bout of pneumonia. Stan was a true community musician and was a vital part of the local entertainment around the New Forest in Hampshire for almost eighty years. He was always asked to play for his friends, at weddings and anniversary parties, for functions arranged by the local gentry, at fetes and local shows and of course in the pubs. He also played at the National Folk Music Festival in 1995, at Sidmouth Festival in 1997 and English Country Music Weekend in 1999. At fourteen he left school to work full-time for the Beaulieu River Sailing Club. By the age of seventeen he was skippering yachts and totally responsible for people�s weekend sailing. Stan carried on yachting in the summer and working in boatyards in the winter until the outbreak of World War II. He then joined the Merchant Navy as a winch-man on Admiralty salvage ships. With his seagoing experience and working knowledge he progressed steadily through the service, ending as Chief Engineer. In 1886 a reading room was given to Buckler's Hard by Lord Montagu. This is now incorporated into the bar in the Master Builder�s House Hotel (where you can see one of Stan�s nautical knot-boards). Here local people gathered for their hops where they would dance and sing for each other's entertainment. They all had their �party pieces� - songs or tunes that they were known for. Many of Stan�s uncles played �musics� (a term they used for any musical instrument played at Buckler�s Hard). Stan�s musical career began at the age of four when he �had a tune out of a melodeon,� and he first played in public at the age of five, for a dance in the reading room amongst friends and family. He has been much in demand for his playing ever since, moving on from single row to two row melodeon, then piano accordion and on to keyboards to keep up with the changes in popular music. His huge store of tunes stemmed mostly from those early days but, in common with many other country players, he picked up many tunes for which he had no name. Some of these seem local to the area. He was always quick to learn the latest popular tunes knowing that they would be demanded by his audience. In 1993 Vivien Drake, of the Countryside Education Trust based at Beaulieu, asked Stan to come out of musical retirement and talk about the old days on the river and show some of the intricate knot and rope work at which he was so skilled. (Stan rigged the yachts for Sir Francis Chichester and Sir Alec Rose for their circumnavigations of the world.) Whilst there Stan mentioned that he could play some of the old sea shanties on the melodeon. Many of these he had learned as a youngster from Frank Downer the harbourmaster, who had run away at the age of 14 to serve his time on Square rigged sailing ships. Stan�s playing of these old tunes, along with tales of the village hops during the '30s and '40s, inspired Vivien to try and recreate those times. So, with the help of his musical colleagues and friends, the first hop was held at the Master Builder�s House Hotel, Buckler�s Hard, in 1994. It was a sell-out and so successful that a second hop was held at Beaulieu Village Hall in 1995. This also sold out. The village hops continued at Beaulieu for a few more years. Similar musical evenings have continued. In 1997 Stan set up a regular 'musical social evening' which brought together many of the older traditional musicians from the Forest. Originally held in the 'pigsty' at the Countryside Education Trust in Beaulieu they moved to the village hall in East Boldre after a couple of years and have continued monthly ever since. Held there on the 3rd Saturday of the month for a paying audience, there are regularly 15-20 local musicians playing a wide range of traditional and popular music on all types of instruments: fiddle, accordions, melodeons, mouth-organs, mandolins and songs. Some of the players and many of the loyal audience had been at school with Stan and had supported his musical events ever since. Apart from his war service Stan lived within a few miles of his birthplace all his long life. He had a phenomenal memory and was always willing to share his recollections, skills and music. He recorded over 60 hours of memories and tunes on cassette which he gave to the archives of the Historical Society at Beaulieu and he always sent copies to his friends. On several of them Stan recorded himself double tracked, playing along with himself on melodeon and banjo- mandolin, two melodeons or melodeon and mouth-organ, all the tunes linked with Stan's memories. I first met up with Stan in 1994 and have been privileged to play with him on many musical occasions and call him a friend since then. In 2006 a cassette of my recordings Village Hops in Buckler's Hard was released on Forest Tracks. Stan was still playing regularly up until last year. 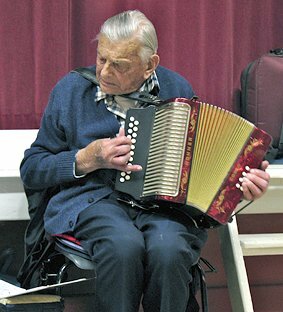 Despite being frail he managed to come along to the East Boldre evening in February and play at his 93rd birthday party. Stan will be greatly missed by his many friends and by all those who've enjoyed his company and his music over the years. There'll never be another! Dave William's article for Musical Traditions MT006 : A few personal thoughts on the social dance, its music and musicians, in a rural environment over the last half century - and a profile of the New Forest accordion player: Stan Seaman, can be read here.